Small outdoor water fountains are important garden decorations for creating beautiful oriental garden design and backyard landscaping ideas. Tsukubai water fountains are for those who appreciate natural elegance of Japanese gardens and beautiful garden design, created with simple forms. Tsukubai water fountain is an excellent opportunity to add exotic flavor to front yard and backyard landscaping ideas or create a unique oriental garden design in a peaceful corner of your garden or backyard, which is perfect for relaxation and meditation. A traditional Japanese garden is surrounding a tea house. Before the tea ceremony guests washed hands and rinsed their mouths, using a water fountain with a small wooden barrel or a stone bowl and a bamboo dipper. The custom was adopted from ancient traditions, when people washed their hands in streams and purified their troughs at shrines before worshipping the gods. There are different types of small water fountains and stone bowl designs for creating Japanese garden: Chōzubachi 手水鉢 Hand Water Basin, Tsukubai 蹲踞 (つくばい) Stooping Basin, Zenigata Tsukubai 銭型蹲踞 (ぜにがたつくばい）Coin Shaped Basin. Tsukubai water fountains, low wash basins, used in a traditional Japanese tea garden, can be created of a stone bowl, a bamboo barrel, pebbles and bamboo sticks. The name comes from the fact that a person has to stoop down to use the water fountain with a low basin. A large stone with a depression may serve as Tsukubai water fountain basin. The water should be running and clean always. Sometimes the water is poured into the basin from a bamboo conduit that stops and starts the flow of water depending on the weight of the water flowing into it. Japanese lanterns, placed nearby and stones on right and left sides are often arranged around the tsukubai water fountains for creating meaningful and beautiful Japanese garden designs. 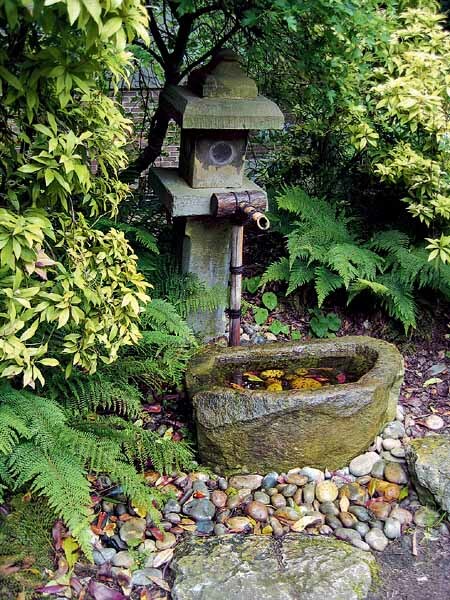 The Japanese culture places great importance on water fountains, dry or water streams and ponds in gardens. Japanese garden designs vary in styles. 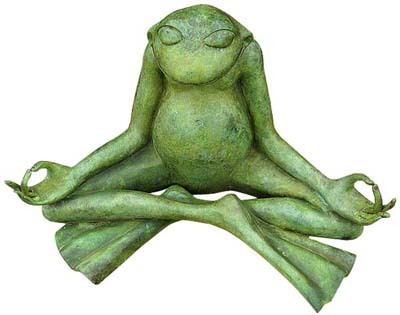 Some of them are dry landscapes with Japanese rocks, pebbles, gravel and sand, while others are full of beautiful water fountains and waterfalls that make simple oriental garden designs look elegant and sophisticated, offering peaceful backyard landscaping ideas, ideal for meditation and rest. Creating Japanese gardens and other oriental garden designs is a great activity. Japanese garden design ideas bring more joy and a real pleasure of enjoying simple forms and natural materials. It is wonderful to see your garden grow, as the result of all your creativity and hard work. One of the basic principals of an oriental garden design is that simple design ideas point to nature, as the most beautiful artwork and a great inspiration. The Japanese garden design is created with natural materials and nature in mind. Japanese garden design ideas reflect the natural things, creating balance and harmony with your backyard ideas. Natural and simple Japanese garden design ideas may look unorganized, but in reality oriental garden designs are balanced, adding a little miniature of nature to your backyard design. Japanese gardens demonstrate a different type of perfection, creating unique and meaningful garden design.